Designing flowers and arrangements for our altars and churches is a very special call of time and talent. In the glory of God and his Church we are called to bring beauty in glory and honor. As we adorn His altar, there are a few things to remember. When communion is being served by our clergy, the celebrant and others need room to bless and administer the sacrament without interference from the altar flowers and arrangements around it. Some years ago, we were in an English cathedral attending Christmas Eve high services. We watched with great trepidation as the clergy navigated around the arrangements at the high altar, impressive but too massive to allow the clergy to easily attend to its 500 congregants. Ultimately, there was a collision between the arrangements and the clergy, and the chalice of consecrated wine was dropped, hitting the stone floor. The Bishop stood there in astonishment as the attending clergy shielded the wine spill from view. After the service, we saw that the arrangements were immediately removed and placed on the adjacent floor so that there would not be another incident during Christmas Day services. We always remembered from that experience that size matters! When creating arrangements, consider the size and shape of the containers and spatial relationships to the altar, and the overall order of placement of the altar and size of the altar. (This can be daunting as we have to think about the view from the pews as well as from the altar area.) We have seen small arrangements in large vases on very large altars, as well as massive arrangements on small altars, as in chapels. When doing flowers for church altars, large exotic Asian lilies for a small side chapel just will not do! Think, too, about your flower choices and their size in relationship to each other both in height and in width. When using large greens, small flowers can become lost. 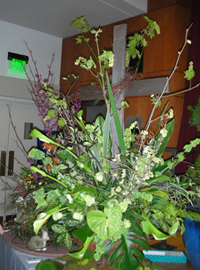 Ferns, (waxed) leaves and ivy are basics to the architecture of arrangements. Allow the ivy at the lip of the vase to gently flow down to about half the height of the vase. Step back and look at what you have done from multiple angles and locations. Then add your flowers. 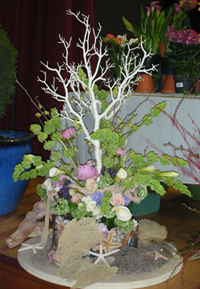 It is customary to make a trinity design (two large scaled flower buds at the base and one near the top). Then add smaller flowers to fill in and complete the arrangement. These arrangements are for our blessed Trinity and are for us to witness His Glory. Let us ask the Holy Spirit to inspire us to do God’s good work by giving the gift of creativity and knowledge to inspire beauty. If you have any comments or questions, please direct them to MKBuds@aol.com.